Rand Paul: "Syria has no clear national security connection" to the U.S.
Sen. Rand Paul wants to know the facts about Syria’s use of chemical weapons first. President Obama is mulling his options for responding to Syria’s chemical attack on its citizens. Senate leaders are quiet, but the chamber’s Kentucky maverick is getting out ahead of the issue. For being a so-called “neo-isolationist,” (then again, maybe not) Sen. Rand Paul released a fairly ambivalent statement about U.S. relations with Syria. “The United States should condemn the use of chemical weapons. We should ascertain who used the weapons and we should have an open debate in Congress over whether the situation warrants U.S. involvement. The Constitution grants the power to declare war to Congress not the President. 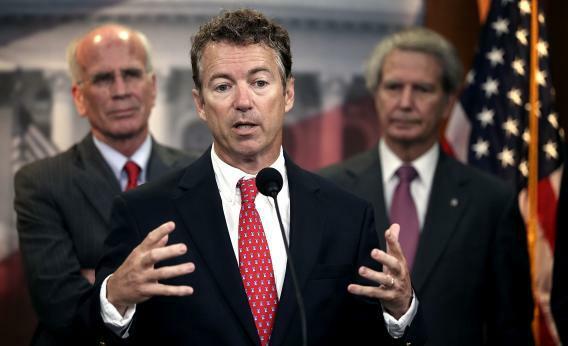 “The war in Syria has no clear national security connection to the United States and victory by either side will not necessarily bring in to power people friendly to the United States,” Sen. Paul said. So he’s for having a debate—in most instances, “I encourage the debate” is pol slang for, “I don’t want to take a side on this issue yet.” And he says getting involved wouldn’t necessarily be good for the U.S. But he’s not counting it out!